Yolo is a fruit from Africa found in Congo. It is believed to be a native on Congo only. It is quite popular with local people and is sold at local markets of Congo towns too. Single stemmed, non-woody rhizomaceous plants, upto 4 m tall; branches merely leaf sheaths rolled into a stem appear to die back during the dry season, with new shoots arising with rainfall. Leaves linear-lanceolate, 5-50cm long, rolling to form pseudoshoots which dry up during dry season and remerge again at the start of rainy season. Flowers cylindrically spiked, white (but, sometimes blue) 10cm x 5cm, arising directly from the rhizome, sometimes found a good 3m from the nearest stems. 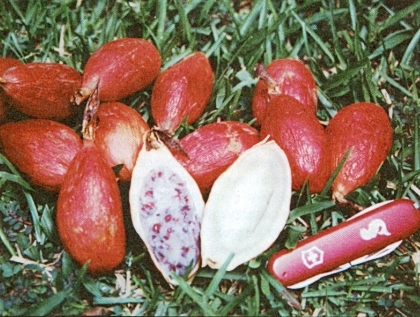 Fruit oval, pointed, 10cm, red; skin leathery, upto 1 cm thick, pulp translucent white, somewhat resembling citrus pulp. Seeds small, black, oblong, numerous, imbedded in flesh. The fruits are edible and popularly eaten by local people. For eating the pulp, the fruit has to be opened by simply splitting open the skin and the flesh is taken out. The flesh is chewed just enough to break it up, but not enough to crack seeds, as they are very spicy. The flavor is tart, but is taste much like the fruit of the salak palm. The seeds and flesh are swallowed together. It makes a good snack food. According to Congolese people, yolo fruits also possess many useful medicinal properties. The best way to raise new plants is from rhizomes. It is also possible to by seed, but the growth of seedlings is very slow. The plants arising out of rhizomes grow fast and start bearing in 2-3 years. A spacing of two meters or so would be fine, depending on the fertility and moisture content of the soil. Broadly two types, which may be different species, of yolo are found in various parts of Congo. One has a larger and rounder plant at the base while the other is quite small and angular. It is also likely that these differences are due to a difference in growing conditions. The plants growing in forest are the tallest, due to the high fertility of the soil and high moisture content (usually they are found near water). 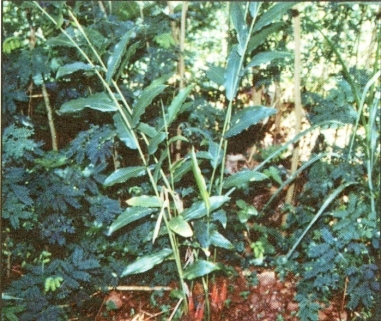 The other, which is a sanna type, type is a shorter plant (around 2m tall), but shoots up the largest of the fruits and is the most common yolo sold in the local market places. All yolo types can withstand 3-5 months of dry season, but the savanna yolo is more adapted to dryness. Due to this characteristic of passing through dry season dormancy, it would seem likely that the savanna yolo would be fairly cold season tolerant.